It's 6.30am and, through the fine mist, the Statue of Liberty, towering in faded green, slowly emerges as we cruise into New York Harbour. None of us on the outer deck need reminding that it's now also a symbol of the courage of New Yorkers, 14 years on from 9/11. We're on a 15-day transatlantic cruise that began in Fort Lauderdale and will end in Southampton on Silversea's Silver Whisper. This is a different kind of cruising: a diverse group of seasoned cruisers who prefer the long, leisurely sea days which make up more than half our 16-day itinerary. We don't have to leave the ship for memorable experiences, content with the simplest of things, such as relaxing in the ship's Panorama Lounge, watching the sun go down to the strains of Gershwin and Porter. Underlying this trip there's the tinge of excitement as we recall the course of the Titanic 103 years ago although we're miles from it – and directions are reversed. As we leave Halifax, where some 500,000 troops left Canada during World War II, Captain Luigi Rutigliano warns of storms, fog and melting ice from icebergs, and the decision is made to bypass the scheduled port of Newfoundland. Still, we're all happy with the Silver Whisper as the destination. With fewer than 300 passengers on board, there's a sense of intimacy, no crowds; suites are spacious, most with verandahs, the linen Pratesi and the bathrooms Italian marble. 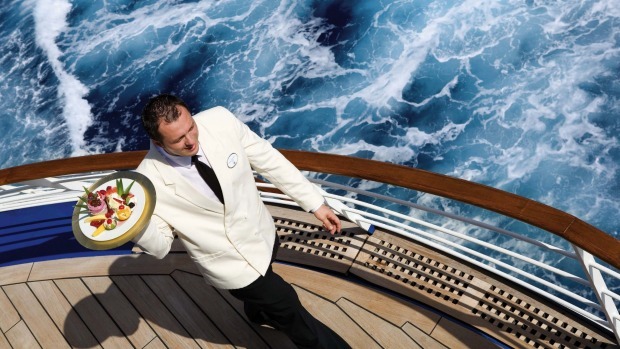 With more than one crew member per passenger, there's always a staff member on hand. Our Filipino butler Rommel, in black tails, sets the table for our in-suite dining, shines shoes, spectacles, ensures the fridge is stocked with champagne, beverages, whatever spirits are desired on-call. 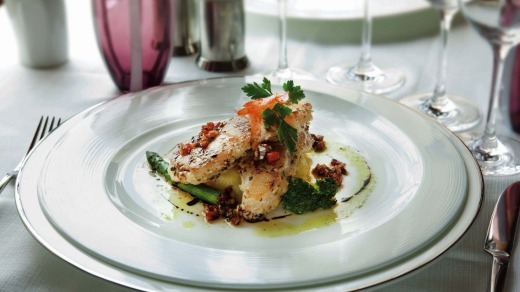 The restaurant's cuisine is superb, not surprising given the partnership with Relais & Chateaux, noted for its fine restaurants worldwide. As hotel director, Frenchman Fabien Leconte says: "If you're No. 1 you would want to be associated with No. 1." 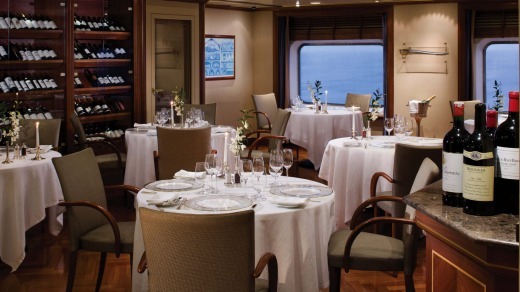 Leconte is well experienced in the luxury market, having served on the Onassis family yacht Christina O when it was offered for charter at $60,000 a day, plus food and fuel. With Silversea's transition from a customer base of mostly American to one that's more diversified – "more Europeans, more Australians" – Leconte acknowledges the challenge of meeting diverse international expectations. "Still, we've come to a mix which is pretty right," he says. Guest lecturers on board include international lawyer Dr Christopher Whalen, whose credentials span cases in Britain, the US and Germany as well as in law schools at Oxford, Washington and Hamburg. Entertainers, too, have impressive credentials. Among them, Australian violinist Ian Cooper, who composed and performed a symphony at the Sydney Olympics opening ceremony, and who has performed with jazz trumpeter James Morrison. We can choose language classes in Italian, Spanish or French, mahjong, poker or bridge, table tennis, join dance classes, take part in trivia quizzes, board games, learn how to mix cocktails, get fit under the direction of a trainer. Or simply contemplate, in silence, from the Observation deck the sound of the wind and the endless, circular sweep of the Atlantic. After 10 days there's more rough weather. With the captain on the bridge all night, another port, Foynes, on Ireland's west coast, is cancelled. But the weather eases as we head to Cobh, formerly Queenstown, on Ireland's south coast. On the bridge, Captain Rutigliano tells of how radar picked up scores of pieces of the icebergs' melting ice, but emphasises the ship's safety procedures: "All the time the ship was sailing in safe conditions," he assures. Of the Silver Whisper, where he has served for a decade, first as second-in-command, he says, "I feel at home – it is a beautiful ship." One of Cobh's key attractions is the Titantic Experience, a recreation of the liner's departure from its last port – where 123 mostly migrants boarded – and sinking. Patrons are issued with tickets in what was the White Star Line's office, Titanic coming to life through still images taken by Jesuit priest Father Frank Browne, who left before the ship sailed, and audio visual dramatisations. 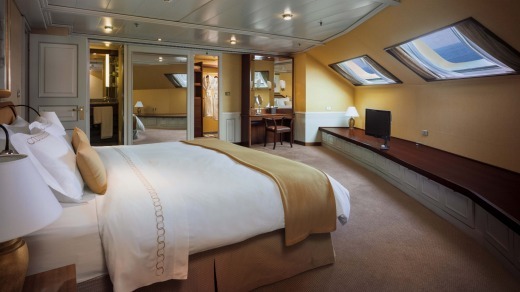 You can view the third-class cabins with bunk beds and bench seating (main course roast beef, boiled potatoes) and the luxurious first class accommodation with canopy double beds, Louis XVI and Queen Anne furniture. The recreation builds to the climax at 11.40pm on April 14, 1912, with the launch of lifeboats, distress rockets, panic, the massive ship breaking in two and plunging down. We're happy to learn that – with tickets as Edward Ryan, 24, and Mary Helen Mockler – my wife and I are among the 44 of 113 "steerage" passengers who survived. 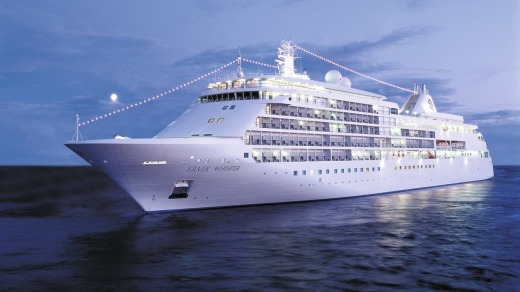 Silver Whisper gives passengers a touch of the high life and even hosts guest lecturers. The Heritage Centre in the railway station adjacent to the port also recreates the departure from Cobh of almost half of Ireland's 6 million migrants during the famine, 40,000 convicts transported to Australia, and the sinking of the Cunard liner Lusitania by a German submarine in 1915. Fewer than 800 of Lusitania's 2000 passengers survived with many of the victims buried in Cobh. Trains leave Cobh railway station on the half hour and hour for the 24-minute run to Cork. You need to dodge cars and vans in the narrow streets of Fowey (pronounced Foy), on the river of the same name, on Cornwall's south-western peninsula, where medieval and Georgian buildings converge. The tourist information centre has an exhibition of the town's famous resident, novelist Daphne du Maurier, her life and works. She's also celebrated in an arts and literary festival in mid-May. A cross below the cliffs at the river's entrance commemorates the visit, according to legend, of Jesus, with rich merchant Joseph of Arimathea who came to view tin mines; Joseph later donating to Jesus the tomb he had prepared for himself. The multimillion-pound Eden Project, a "global garden" of landscapes, ornamental plants and crops, developed in a former china clay pit and the sprawling Lost Gardens of Heligan are both within 30 minutes' drive of Fowey. A different cruise, but the warmth and spontaneous reaction of a packed theatre of passengers at the captain's farewell, when the entire ship's company parades before us, gives it overwhelming approval. Silver Whisper runs on 17-day trans-Atlantic cruises between Southampton and Montreal, stopping at ports in Cornwall, Ireland, Iceland, Greenland, Newfoundland and Quebec. Per person, twin share, its 2016 cruise starts at $12,350 and 2017 $10,350. Qantas has daily flights from Sydney and Melbourne to London; see Qantas.com. Silversea can arrange coach transfers to Southampton, a journey of a little more than an hour; there are also other coach services. John Coleman was a guest of Silversea.